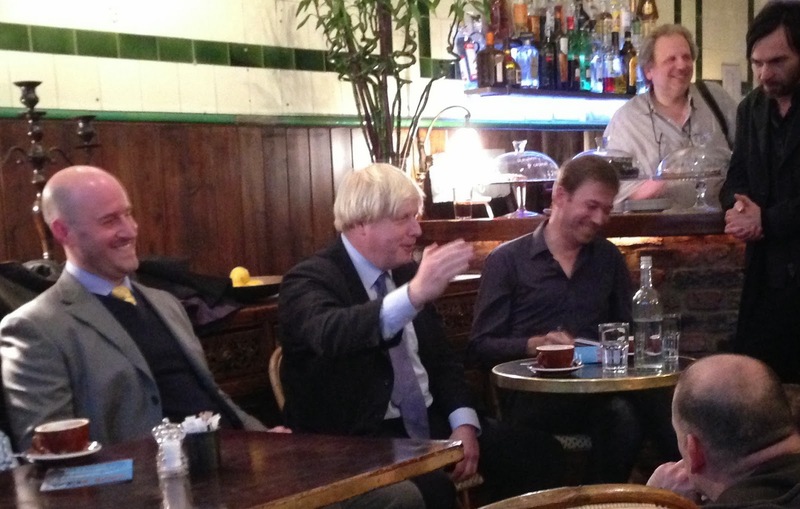 Boris Johnson is either an ambitious and gifted politician or an incompetent buffoon. Whichever side of the divide you sit on, he is, indisputably, the Mayor of London and the blondest man you’re likely to see this side of Scandinavia. This Thursday he made a relatively low-key and very short notice visit to West Hampstead to take part in a roundtable discussion with local business owners, under the banner of the relaunching West Hampstead Business Association (WHBA). 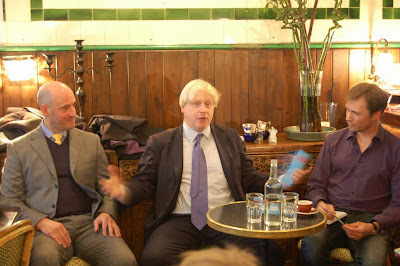 Local Conservative Party candidate Simon Marcus had managed to persuade his BoJo-ness to come along (lets remember this is by far London’s most marginal seat), so The Wet Fish Café was half-full of local businesses and half of local Tory supporters and hangers on. And me. I was tasked with chairing the debate, which in reality meant trying to keep some control of Boris. To his credit, he did actually try and answer almost all the questions that I and other local business people put to him. And to their credit, the local Conservatives didn’t interrupt or whoop or make a nuisance of themselves. The result was a meeting that although predictably light on meaningful dialogue, was both entertaining and engaging. We opened by asking the Mayor what City Hall could do to help small businesses. 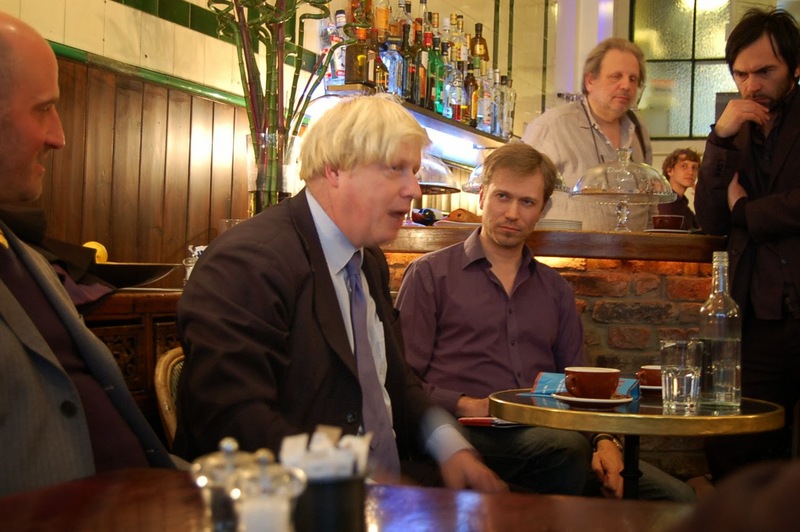 Boris of course takes the extreme laissez-faire approach to economics, putting him to the right of many in his party (by contrast, he’s socially relatively liberal). So the answer to the question – if you read between the lines – was really that local businesses needed to help themselves. That of course is exactly what forming a business association is all about. He also suggested the WHBA looks at forming a BID (Business Improvement District), although West Hampstead would be quite small for a BID, and the scheme has come under some criticism for ultimately driving rents up. But it’s something no doubt the WHBA will look into. There were questions of course about the extent of development in the area – and the type of development. With such a heavy focus on small one- and two-bed flats being built, it’s hard to see how the area’s weekday daytime economy will benefit as the occupants of these flats will be off to work. 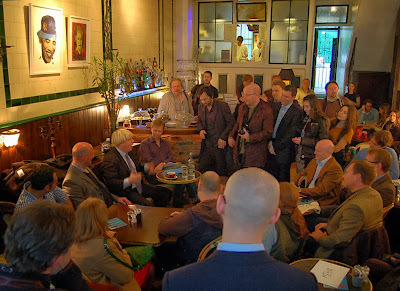 Boris countered that there was a mandatory quotient of three-bed properties in any new development and that Camden must be delivering this. Of course, one only needs to look at West Hampstead Square or the Mill Lane Apartments to see that the 3-bed properties are more “luxury penthouses” than “family homes”. Boris also returned to a theme he’d addressed in his controversial speech the night before. He suggested that there was too much paranoia about foreign investors buying London property and that the money coming in was helping fund major schemes such as those around the Olympic village, Battersea, and Brent Cross. 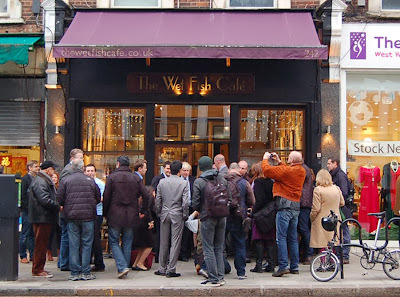 None of which particularly helps businesses in West Hampstead of course. It’s not helpful to be over-parochial about such things, but high streets generally need support so they’re well placed to rise as the economy recovers. One of the mayor’s more practical thoughts was that some high streets – and he clarified this didn’t apply to West End Lane – were simply too long. If, he said, councils sought to concentrate long strung-out high streets using planing and zoning laws, then it would be easier to keep them vibrant. This strikes me as generally being a good idea – it might even help make a tiny dent in the housing shortfall if property on the fringes of these high streets could be converted into residential. Kilburn High Road is probably about as long a high street as is viable without splitting into separate sections, but it’s possible to think of others in the wider area that lack any defined central point – Harrow Road, for example. 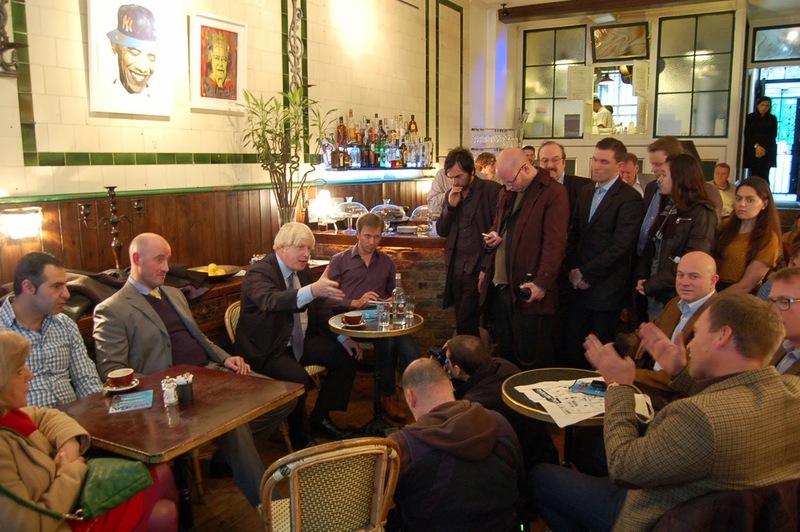 Lorraine from Mamacita asked Boris what City Hall could do in terms of reducing red tape for smaller businesses. This turned into a bit of a convoluted conversation, but ultimately the mayor said he was in favour of loosening employment restrictions for businesses that had five staff or fewer. He struggled to understand why any business owner would have any problem firing anyone though. “I fire people all the time”, he said with gusto. And with that, he trotted off with his entourage down West End Lane, first calling into West End Lane Books, where he (reluctantly, apparently) bought a copy of Zadie Smith’s NW. He was heading for St James’ Church where he met with Father Andrew Cain who explained how the post office was going to fit into the buidling. 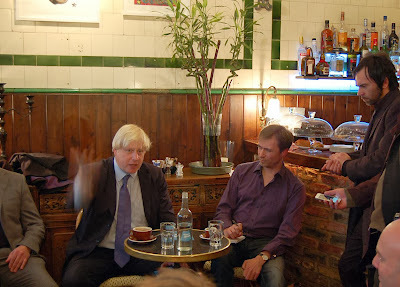 He then detoured to café Wired and Rock Men’s Salon on Broadhurst Gardens, where despite owner John’s best efforts, Boris couldn’t be persuaded into a chair for a trim of his white locks.